Prehistoric fiction was new to me until fairly recently, and now it has me completely captivated. 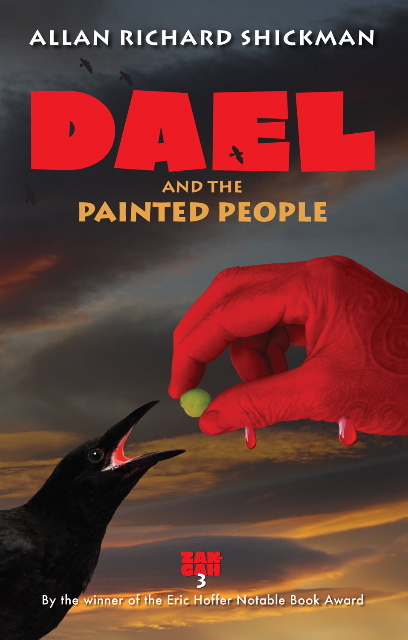 I believe that Patti, the lucky winner of a set of three Zan-Gah books by Allan Richard Shickman, Zan-Gah: A Prehistoric Adventure, Zan-Gah and the Beautiful Country, and Dael and the Painted People, will feel the same way. This set of books is unique and very enjoyable to read. Congratulations, Patti! If you didn't win these books, you may be tempted to enter the other book giveaways listed on the side of my blog. Book Blogger Appreciation Week is here, September 12 - September 16. I haven't done much in this regard yet, except to read a few of the related posts of others. To be honest, I took a bit of a hiatus from blogging, and am having a hard time catching up. But, BBAW is a great way to meet new book bloggers, and to show appreciation for "old" book blogger friends as well (make new friends, but keep the old. . . ). I know a great deal of effort went into the planning of BBAW, and I'll hopefully participate in an activity (meme?) or two this week. What are your favorite activities during BBAW? Appearing on random Tuesdays, Really Random Tuesday is a way to post odds and ends--announcements, musings, quotes, photos--any blogging and book-related things you can think of. If you're inspired by this idea, feel free to copy the button and use it on your own blog. For other recent Really Random Tuesday posts, visit Avis' blog, she reads and reads, Veens' blog, Giving Reading a Chance, and Vivienne's blog, Serendipity Reviews. Please leave a link in the comments if you’re participating and I'll add it to this post. WTG Patti, enjoy the great series! It's funny : we write both on prehistoric times in our "blog again posts" ! I'm happy to read you again and like you (if I have well understood !) it seems me difficult to write again. I wanted to get more involved in BBAW this year but haven't had the extra time. Well.. I still have the rest of the week. Congrats to Patti on the win. It looks like a great series of books. I just participated in my first ever BBAW activity and it was pretty fun. :-) I'm excited to do more with it in the future. Suko, I am glad to see you back! I have been wondering how you have been, and was excited to see your post today! Congratulations to your winner as well! Hi Suko :) Glad to see you back. Congrats to the winner, I like the Zan series too. I have to get over to BBAW and check it out, it's always fun. I haven't had a chance to check out BBAW yet. Wow! I hope I'm not too late. On vacation in KY and just got into a town with wi-fi. Woot! The term "prehistoric fiction" just gives me the giggles. And I had a hard time participating in BBAW too.